The report finds the most pressing concerns to be within the area of the individual’s right to be presumed innocent until proven guilty. The data shows a practice where this norm is reversed as defendants often appear in convicted prison uniforms; presenting them as guilty before trial. This is further fueled by a number of cases where defendants are absent in their own court cases, unable to present a defense. In addition, the quality of evidence presented in hearings is often poor and threatens the right to be convicted beyond a reasonable doubt. Finally, judges are systematically failing to explain the nature of fair trial rights to the defendant, making it difficult for defendants to challenge violations of their rights. However, while judges are failing to explain their rights to defendants, they are successfully informing them of the existence of their rights; strengths such as these show just how easy it could be to improve parts of the justice system. Public hearings are now almost fully guaranteed with the Court of Appeal posting public hearing notices outside courtrooms. The report also finds that defendants are given adequate time to prepare a defense. With these strengths in place, the recommendations made by CCHR are realistic and achievable. Simple logistical improvements between detention centers and the Court of Appeal could eliminate the serious problem of defendants appearing in convicted uniforms; or not appearing at all. The Court of Appeal still faces challenges in guaranteeing the right to a fair trial; especially with the recent three laws on the Judiciary adopted by the Parliament which undermine the independence of the courts; but these challenges can be overcome through cooperation with civil society and the courts to encourage and promote reform among the judiciary itself. Lale Kuzu, CCHR International Intern, contributed to this post. 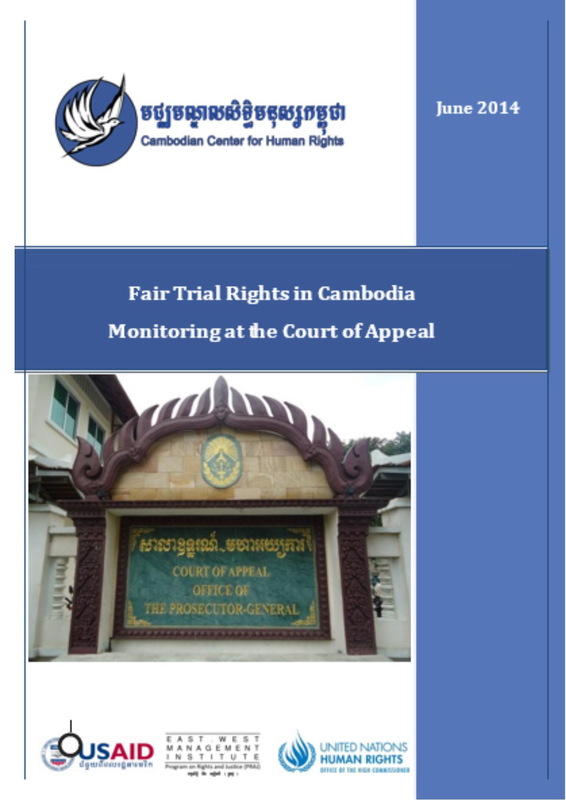 This entry was posted in Judicial Reform, Publications and tagged Cambodia, Court of Appeal, fair trial rights, justice system by Cambodian Center for Human Rights. Bookmark the permalink.